Earlier this week, I spent a day in my district’s curriculum office revising the pacing guide for our World Literature class. As a result, I missed a day of teaching, so my students had a sub. After several years of coaching debate and missing a lot of school because of it, I am something of an expert at leaving sub plans. I have a great system (using this free tool) in place. However, this time, my sub plans went awry! I forgot to post an assignment on Google Classroom. But then my sub also handed my juniors, who are working on identifying different types of prepositional phrases, my sophomores’ relatively benign grammar quiz. Thankfully my juniors realized they had the wrong quiz, but the mix-up still made me wonder where I went wrong. In this case, I think something as simple as additional highlighting on the plans may have made a difference. But this also got me thinking about other times I have learned from failure. Hopefully this list of lessons learned will help other teachers avoid some of my mistakes. Seating Charts: When I was a new teacher, I had this utopian idea that all my students should sit in groups. They would learn about team work and community. That’s a perfectly fine perspective. But, at the time, I did not have the classroom management to handle this seating situation. In fact, I quickly learned that seating charts are a great management tool. I still believe that students deserve to learn about team work and community. But I incorporate those concepts through flexible grouping, movement, and discussion. Asking for Help: My third year of teaching, I had a class of fifteen senior boys. They were all enrolled in our district’s vocational program, so they had wide knowledge of auto collision but not a great interest in English. As a result, we read a lot about car repair and automotive technology. One of our persuasive lessons was to design a Craig’s List post persuading buyers. However, as a third-teacher, for every innovative idea I had, there was at least one or two things I could have done differently. For example, because I didn’t use a strong seating chart, the boys were put in positions to make all kinds of poor choices. One time they threw a taco. One week they were fascinated by spit balls. Once or twice they tried to staple their own hands. It was not good, and I did not know how to ask for help. However, once I started contacting parents (with this free form), counselors, and coaches, things got better. A group of people were now working to make this class meaningful. I still think about this all time, wishing I had started reaching out sooner, wishing I had shared some positives before I had to share concerns. This is a lesson I am still learning and still working on. In fact, one of my classroom goals for the year focuses on increased parent contact. Bottom line: building relationships with students, parents, and other stakeholders helps in all areas of the classroom. Rubrics Forever: One of my department’s strengths is our use of common rubrics. This is an absolute saving grace. But there have been times when I did not use this strength as well as I could have. For my first several years of teaching, students would write a draft, I would provide feedback, they would revise, and only then would I apply the rubric. This gave my students a sense of betrayal as though I were suddenly changing the rules halfway through the game. As a result, I learned that students should see the rubric from day one. While we work on a paper or project, we consider different exemplars and apply the rubric. We then discuss exemplar strengths, weaknesses, and concerns. When my students turn in a draft, they grade themselves in one color; then I provide draft feedback using the rubric. This gives students clear areas where they can focus for improvement. We repeat the process for the final copy. As a result, I rarely have students question their grades. Technology Helps: My school is now 1:1 Chromebooks, but when I started teaching, we just had some laptop carts. As a result, when students submitted papers, they had to print everything. School technology being what it is, printing would take an entire class period. It was not an efficient use of class time. It led to all kinds of opportunities for students to make poor life choices. Thankfully, a co-worker introduced me to Google Docs early on! Even before Google Classroom, my students were able to share a draft with me, alleviating the need to waste precious instructional minutes in the blackhole of printing. Ultimately, my takeaway here is that classroom technology is invaluable. The greater lesson is that classroom minutes are precious and any activity that suggests otherwise sends the wrong message. Brainstorming: When I started writing today’s blog post, I typed out an outline of headings and subheadings, creating a kind of roadmap. This structure helped me decide which lessons to prioritize and which failures were the most instructional. Clearly, brainstorming is an important part of the writing process. I ignored that insight for a long time, which you can read about here. As a result, I have learned that my students deserve to spend a portion of class time developing evidence of brainstorming. To make sure that all students are able to find a brainstorming style that works for them, I developed this tool. Setting Discussion Norms: This year when my sophomores began reading Julius Caesar, our first day of reading and “acting” was giggle heavy. We could not get into a meaningful rhythm to make sure we understood the play. As a result, I decided to take a step back and ask students to establish norms for reading, acting, and discussing the play. I don’t know why I wasn’t doing this from the very beginning! By posting the norms and revisiting them at the top of each lesson, students were better able to focus on the play. Once I did this with my sophomores, I started doing the same thing with my juniors before peer revision and Socratic Seminar. What a quick way to help students take ownership of their behaviors! Teaching is a process of continual learning. As my sub snafu this week reveals, some failures are easily remedied with a highlighter. Other moments of failure are more pervasive and require reflection. Nevertheless, learning from failure remains one of the most important factors in growing and developing. When teachers model the process of learning for their students, I see hope for the future. What are the lessons you have learned as a teacher? Remember to subscribe for new posts every Tuesday. 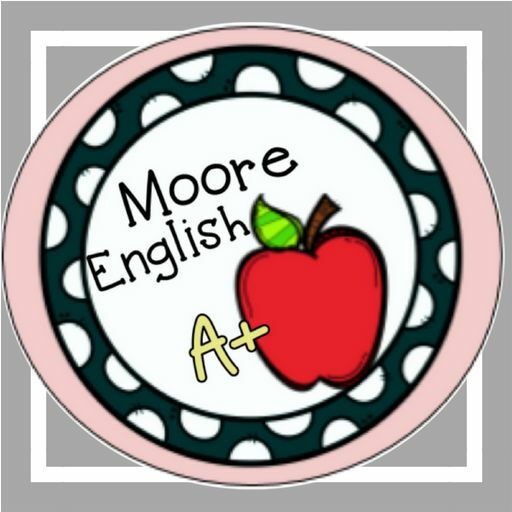 Follow along and keep in touch with Moore English on Instagram, Pinterest, and Twitter. My sophomores recently finished acting out William Shakespeare’s Julius Caesar, so today they had a Socratic Seminar discussing some of the play’s most contentious issues. Were Brutus’ actions justified? Did Caesar deserve death? Is rhetoric dangerous? In particular, my students were eager to discuss the play’s hero: is it brooding, patriotic Brutus or eloquent, deft Mark Antony? Which figure would be the best leader for Rome? In other words, my students wanted to know who was in the best position to save Rome. Unwittingly, my students were buying into heroic thinking, which can be every bit as dangerous as Antony’s oratory. Heroic thinking recognizes a problem and seeks a white knight to solve the problem. Like the Roman people, education is no stranger to heroic thinking. In education, heroic thinking suggests that systemic problems ( low literacy rates, high absenteeism, deep inequity, outmoded funding mechanisms) can be solved by bold keynote speakers, one-day professional development, and leadership turnover. Like the quest for perfection, this kind of thinking stymies progress and growth for teachers and students. Instead of heroic thinking, education needs connection, compassion, and coalition. As Shakespeare’s plays often reveal, humans are “not very good at telling stories about a hundred people doing things.” Instead, we prefer stories with “lone and exceptional heroes” touched by destiny. Something makes such figures special (a lightning bolt scar, eternal youth, a peg leg), so heroes are somehow above the Everyperson that they are supposed to represent. In trying to be like everyone, these figures end up above and apart. Isolation is not an effective agent of change. Instead of isolation, change comes from connection. In “When the Hero is the Problem,” author Rebecca Solnit reflects on the problems associated with isolated, lone leaders. She writes that “positive social change results mostly from connecting more deeply to the people around you than rising above them, from coordinated rather than solo action.” This makes a lot of sense. After all, the best teachers put relationships first with students because we know that relationships and trust provide the foundation from which growth occurs. The same is true when considering education’s systemic problems. Any changes that education encounters will come from groups that are tightly connected–whether those groups are in Oklahoma, Kentucky, or Los Angeles. How do groups grow tight? They tell stories. Limiting stories to the tale of the heroic individual fails to give listeners a chance to see “what could be.” Such single stories prevent listeners from recognizing their potential as agents of change. In other words, educators must get better at telling our stories. As teachers, we often struggle to celebrate our own successes, but we have to share them. We cannot horde our stories and successes but must pass them on and share them. This is how we connect with one another, with our students, and with our communities. We tell our stories. Storytelling is a special window into someone else’s life and worldview. Telling our stories allows others to follow Atticus Finch’s advice and try on someone else’s skin for a while. In other words, storytelling elicits both connection and compassion. These positive emotions are the truest change agents–and they exist in everyone, not just with the destiny-burdened orphans. Lone hero stories may be exciting, but readers often pity Gatsby rather than empathize with him. Readers may enjoy an Arthurian legend, but Arthur’s crown puts up clear barriers. The greatness of such characters often relates to or extends from typically masculine characteristics such as physical strength or the ability to wield a lightsaber (this invites a critical lens). However, as Solnit points out, the virtues required for change “are those traditionally considered feminine…listening, respect, patience, negotiation, strategic planning….” In other words, the skills needed to be a storyteller as also those skills most likely to drive and affect change. Storytelling creates connections, and from those connections, we learn compassion. All fields and aspects of human life, education included, benefit from such experiences. In particular, education can combat heroic thinking by promoting compassion. With connection and compassion, teachers can form a coalition. In Julius Caesar there is, of course, a coalition: the conspiracy to assassinate the tyrant. However, the conspiracy was held together by ambition and fear, not by compassion. Its actions were selfish rather than selfless. A coalition of educators can affect more change through compassion than thirty senators wielding daggers. As Solnit reminds readers, “our largest problems won’t be solved by heroes.” The problems in education are myriad: low literacy rates, high absenteeism, deep inequity, outmoded funding mechanisms, etc. But none of these problems can be handled with a sword and shield. Instead, considering and confronting these issues requires careful planning, negotiation, organization, and coordination. These actions require the insight of the collective, but large-scale buy in comes from groups, not individuals. Of course, as teachers, we often find problems outside our control. In these situations, our initial reaction may be to shut the door and teach, but Solnit points out that “the narrative of individual responsibility protects stasis” rather than promotes progress and growth. In other words, ignorance favors oppression. Instead of complacency or apathy, an interconnected group of teachers telling their story can stand in opposition. It is collective action that leads to change. Unfortunately, Rome could not be saved. As my sophomores could tell you, tyranny is as much a problem in Julius Caesar as ignorance. From the first scene, Shakespeare casts the common citizens as incapable of questioning the narratives around them. For this reason, educators must be telling our stories, not letting someone else speak for us. Teachers, tell your stories, connect with one another, have compassion for one another, and surround yourself with others who complement your story, who lift you up rather than break you down. Abandon heroic thinking. Look not for the heroic individual but for the connection, compassion, and coalition that truly affect chance. One of the problems with perfection is its resistance of change. Perfection lacks humility, so it also precludes any opportunity for growth or development. Vulnerability is the antithesis of perfection. Practicing vulnerability allows us to grow and to model the process of growth for our peers and for our students. In the classroom, vulnerability can come from admitting when you are wrong, from taking risks with your pedagogy, and from inviting other professionals to observe your teaching and help you grown. As a bonus, each of these opportunities can also be a great source of classroom inspiration. This time of year sees a lot of teachers emphasizing test prep, but standardized testing is all about perfection, not progress. Standardized testing is stressful, but rather than pass that stress on to students, teachers can help students focus on the progress they have made and will continue to make rather than focusing on test scores. Using student goals and data can be a great way to help students visualize growth. Prior to our state test, I like to visit with students individually to help them see how much growth they have made during the year. With this in mind, I then try to present the state test as an opportunity to show off rather than stress out. As Becky Hale mentioned, some of the most meaningful moments are mundane. For me, these are the source of great joy. When students guide one another, or when students make an unexpected connection with a text, or when students bring a text to life–these are brightest moments in my classroom. However, these are transitory and ephemeral moments, so they can be easily overlooked amidst classroom chaos and test-prep crunch time. For this reason, teachers have to work to find and emphasize joy over perfection. As teachers we know that every great moment may also be followed by student struggles, so we have to continually remind ourselves to seek joy. Our students are reflections of us, so when we seek joy, so too will our students. When we emphasize progress and growth mindset instead of perfection, so will our students. How will you resist perfection? As a student teacher, I had a student who wore ears and a tail to class. Since then, I have had many students educate me about the evolving meaning of identity, our role in crafting student identities, and the importance of narrative in identity creation. Unfortunately, my cooperating teacher at the time did not understand the role teachers play in helping students develop their identities. Instead of treating her student with compassion, she tweeted glib remarks about her student and their identity. (Her twitter account has since been disabled.) This experience affected me profoundly. However, one of the most enduring lessons from this experience was the realization that teachers and teaching exist beyond the classroom. Last week we talked about the teaching that happens in the hallway, but that got me thinking about the teaching that occurs in other between spaces. A between space does not exist during class time and may not even occur within the school building or day. Nevertheless, teachers (and, really, all people) should be aware of the impact of their actions even in between spaces whether those spaces are planned, spontaneous, or intangible. The school day provides frequent, reliable between spaces, including conferences and school assemblies. These are opportunities when teachers can plan for and anticipate opportunities to put relationships first. In these kinds of between spaces, the best advice is to buy in. Your school has an expectation for how teachers and students should behave in and interact within these spaces, to lean into that expectation. Similarly, planned between spaces are a great environment for emphasizing relationships students. These environments provide students and teachers with a common language. In the case of a pep rally or football game, this language is fairly low-stakes. Starting a relationship on safe common ground can provide teachers with a great foundation for getting to know students. While teachers can plan for many of their interactions with students, other opportunities are spontaneous. Other interactions like this one include lunch time, bus duty, tardy sweeps, and any other unplanned interaction. One of the hazards of teaching is meeting students outside of the school day. As a high school teacher, I frequently encounter students at the grocery store because that’s where they work. In spontaneous between spaces, teachers almost always set the standard for behavior. For example, if you ignore a behavior during lunch time, students will pick up on that cue. However, if you are at the gym and greet a student, they will also greet you. While I must admit that sometimes these situations can be less than ideal, they are opportunities all the same. When entering a spontaneous between space during the school day, teachers have an opportunity to build relationships by upholding expectations. However, when these spontaneous between spaces occur outside of school, teachers can show students that we have lives outside of school. We model adult life and all its oddities. When I was a new teacher, I thought I always had to look perfect before going out in public lest I encounter a student. That was unattainable and unrealistic, and it missed the chance to model for students how adults behave in public. Still other between spaces are more nebulous. These spaces are largely digital but include email and social media. This is where my one-time cooperating teacher stumbled. The expectation for a professional communication and social media are different in that one is tied directly to teaching and the other may be more personal than professional. However, as errant professionals have learned, nothing on social media is a secret. As with other between spaces, digital communications provide teachers the chance to model best behaviors. Professional Communications: Nothing seems worse than an email that goes too long without an answer or a co-worker pressing “reply all.” These behaviors should be easy enough to teach against. For this reason, teachers should use their best etiquette with any professional digital tools. We should also be modeling for students how they should be interacting on digital platforms like Google Classroom. Social Media: Unlike professional digital tools, social media often intersects with teachers’ personal lives. Nevertheless, students are curious and not above Google-ing their teachers. For this reason, everything you (or, really, any person) posts on social media should be something you would be okay with students reading. Why have a student see their teacher complaining about them when a student could see their teacher advocating for them? This is constantly a question I wish I could take back to my cooperating teacher. Between spaces provide teachers with opportunities to model behavior and build relationships with students. It’s easy to overlook these moments as transitory or ephemeral because they are, but teaching is also a matter of moments. Teachers have a finite amount of time to make an impact on student lives, so why ignore any opportunity? It’s a teacher truism, but a lot of teaching happens in the hallway. No one really plans for hallway teaching, but that’s what makes the hallway such a powerful tool! Teachers can accomplish seemingly small but mighty things in the hallway! Because hallway conversations often happen unexpectedly and quickly, it’s easy to miss the golden opportunity they often present. Thinking on your feet can be challenging, so here are a few types of conversations every teacher should master. With these in your pocket, you will be ready for whatever the hallway brings! With Students: Every teacher knows that greeting students at the doorway can have a positive impact. This is a great way to begin building relationships with students. One of my colleagues has special handshakes for certain students. Seemingly small gestures like this can make students feel welcome and seen. Similarly, while teaching in the trailers this year, I have made an effort to always be ready to greet students from the porch. In the rain I hold my umbrella, and in the cold I wear many layers. But greeting my students makes a huge difference! With Teachers: During passing time, students are building relationships with their peers. And the same is also true for teachers. I have met other teachers in my building as I do tardy sweeps. Seeing other teachers complete tardy sweeps lets me build a rapport with them so when I need support from another teacher, I know who I can count on. This also signals to other teachers that they can count on you. The hallway can also help you get to know your building’s support staff. Last year the special education classroom was across the hall from me, so I was able to interact with paraprofessionals and therapists I otherwise would never meet. Finally, being visible in the building also helps your administrators see how much you have to offer. Tough Conversations: We all have hard days. This is true for students, too. Sometimes students need a moment to collect themselves, and the hallway can provide the perfect place. One of my co-workers has a knack (or, really, has built extraordinary relationships with students) for recognizing when students need to step away. When this happens, she will send them to the water fountain or ask them to run a quick errand. Earlier this semester, one of my students was tearfully stressed about her workload. The porch of our trailer proved to be the perfect place for her to fill me in on her struggles. The entire conversation took two minutes, but weight came off her shoulders. Tough(er) Conversations: In addition to hard days, sometimes students have bad days. I also have bad days. However, students cannot always manage on these days. Sometimes they make poor choices: flipping off another adult, refusing to work, throwing tacos (no joke). When this happens, the hallway can provide a place for a quick conversation about choices and consequences. I very much come from the school of “You can make a choice, but your choice may have consequences.” The hallway often provides the venue for reminding students about actions and consequences. In a few minutes, teachers handle poor classroom behavior. Smart Classroom Management has some great pointers on how to enforce classroom rules and how to apply consequences. This pointers also work for the hallway! The hallway also provides a space for supporting other teachers. This space is special because it is unstructured. Your conversation probably lasts less than a minute, so every word counts. In this situation, you may discuss seemingly trivial details about weekend plans, favorite shoes, or misplaced keys. However, these details build relationships. Furthermore, these relationship-building conversations often lead to more curricular subjects. Maybe a lesson went well and your colleague wants to share! That’s great! Let her share what worked and ask a question to signal your interest. Let her shine, and she will walk into the next block ready to face anything. On the other hand, maybe a lesson crashed. Let her share and ask a question to prompt reflection. Don’t pile on or let her carry on too long–otherwise you’ll lose your opportunity. Instead, try to send your colleague back into class with a purpose: to reflect and figure out what to do differently next time. In this situation, I have two favorite questions: What will you do differently next time? And, if she says, “I don’t know,” I like to ask: “Well, if you were advising a teacher in your shoes, what would you say?” These two questions are so similar, but the hypothetical nature of the second one seems to get teachers out of a funk and into reflection pretty quickly. Either one reveals the true power of the hallway! How do you use the hallway? What are your tips and tricks for helping teachers make the most out of hallway conversations? Last week I read a Buzzfeed article about life’s unwritten rules, which got me to thinking about the unspoken rules of teaching. Some of these rules are no-brainers, things every professional should be doing on the daily. However, some unspoken rules are dangerous, irresponsible, and every teacher should be breaking them! 1. Use Office Etiquette: As anyone who works in an office knows, there are some unspoken rules about office etiquette. These rules apply to education, too! The Copy Machine: If the machine jams on you, fix it or contact the person in charge of fixing it. Similarly, if the machine runs out of paper or tone or staples, refill them or contact the person who is in charge of these items. Additionally, if you do not know who to contact or how to change the toner, please, please, please ask. Other teachers will respect you more for admitting you don’t know something! The Coffee Pot: The same rules apply here. If you drink the last pot of coffee, make a fresh pot. Be a human being. 2. Prepare for Absences: This is an unspoken rule specific to education. Being absent from school is stressful, but your absence should only be stressful for you. Students and co-workers should not suffer because you are absent. Of course, a substitute cannot replace a trained teacher, but sub plans should be detailed enough to keep students focused and on task. Similarly, sub plans should help the sub anticipate issues before they arise. To help in this pursuit, I have a free sub plans cover sheet to make leaving plans simple and efficient! Additionally, if you know you are going to be absent, it is your responsibility to print your sub plans and ready your sub tub. Please do not email co-workers at the last minute asking them to print plans and handouts. Unless an absence is unexpected, you should be handling all of this ahead of time. 4. Celebrate Support Staff: Even if you disregard every other unspoken rule on this list, please remember to celebrate building support staff. Education is a field of unsung heroes: cafeteria works, custodians, administrative assistants, paraprofessionals, librarians, crossing guards, and bus drivers. Without support staff, schools would not function, so make sure to regularly thank support staff. Let them know how much you appreciate everything they do! 1. Tracking Students: An unspoken rule seems to be that students who have trouble sitting still in class must be struggling learners. Similarly, students who sit quietly in class and behave well must be honors students. These kinds of misunderstandings come from not developing meaningful relationships with students. Making decisions about students’ academic skills based on their behavior is not appropriate and is actually one aspect of education that scares me. So break this rule! Find behavior interventions that work for your students. Use data to make decisions about student placements. 2. Making Modifications: A spoken (like legally binding) rule in education is that teachers make modifications based on IEPs and 504s. However, there seems to be an unspoken rule that if a student does not have an IEP or 504, teachers do not need to make modifications. That’s nonsense! Break this rule! Differentiate for all students based on their needs. We do this when we make recommendations about free reading books. Teachers do this when we select guided reading groups. We do this when we design seating charts. Keep giving students the individual treatment they deserve! 3. Teaching with the Door Closed: Another unspoken rule in education seems to be that if the building is in chaos or is going a direction with which you don’t agree, you can simply close your door and teach. I mean…I suppose this is true. You can ignore the building happening around you, but that is not the best way to advocate for your students. Instead of closing the door and teaching, invite administrators and instructional coaches in to your classroom so they can see your concerns and your best practices in action. Instructional coaches and peers are great tools. Your door does not literally have to be open, but you cannot simply ignore the building around you. Choosing ignorance is never the right choice. Here’s an article from Cult of Pedagogy in the same vein. Break this rule, and open your door! 4. Avoiding the Teacher’s Lounge: Another unspoken rule in education is that teachers should avoid the lounge because it is a negative space full of gossip and petty behavior. While you should avoid negative behaviors, venturing in to the teacher’s lounge can also be an opportunity to connect with other teachers. Teaching can be isolating, so seek out other educators to help you grow. Focus the conversation on classroom victories, advice seeking, and positive common ground. The lounge becomes a negative place when we allow it, so take back the lounge! What other unspoken rules should teachers follow? Which ones should we break? Let us know in the comments! I teach in an old building. Because of its age, the building is actually undergoing massive construction. Most of my English department is teaching in mobile units, and the nearest bathroom is a porta potty. Despite the building’s age, our library is well maintained. Due to the construction, many of the books are in boxes, but I recognize how privileged my students are to have access to a good library. A quality school library is a great resource, and today I wanted to share some ideas for making the library a meaningful part of your ELA instruction. The most obvious way to get the most out of your school library is to use its offerings to support choice reading programs. Right now my students are reading a choice book during sustained silent reading at the start of each class. Throughout the semester, I use comprehension interviews to assess specific skills and fluency. At the end of the semester, students will make a formal presentation about their choice books. The librarians were great in helping my students select choice books. Two years ago, our librarians decided to organize the fiction by genre, and that has helped point students to books they might enjoy. Additionally, our librarians put on countless reading programs, book tastings, and reading clubs to promote literacy. Each of these events offers students a chance to “try on” different books and styles. Inviting your librarians in to your classroom can be a great way to start choice reading in your classroom. Who better to make recommendations to your students than the librarians? 1. Generating meaningful research questions. CCSS.ELA-LITERACY.W.9-10.7-8 both require students to generate research questions before conducting the research to answer their questions. Writing high-level questions can be challenging. But as the keepers of research, librarians have plenty of experience generating, modeling, and refining inquiry. 2. Introducing research resources. Since CCSS.ELA-LITERACY.W.9-10.8 requires students to gather credible, relevant research, librarians can help students explore their research resources. Undoubtedly, each school has unique resources, but librarians are the perfect candidates to introduce research databases, reference books, and card catalogues. Because students must be able to work with a variety of sources, I often require students to support their claims with at least one database and one book source. This way students work with a variety of resources and learn to cite them correctly. 3. Developing meaningful search terms. My juniors just finished a persuasive paper. One of the prompts asked students to determine whether safety or freedom is more valuable. Every year I have a student type into a database: “Is freedom more important than safety?” Needless to say, this search returns less than desirable results. This is where librarians can help students transform their research questions into meaningful search terms. Our librarians do a great job modeling the process of brainstorming search terms. 4. Determining source credibility. In addition to conducting meaningful research, students must also determine the credibility and relevance of each source (CCSS.ELA-LITERACY.SL.9-10.2). While students recognize that database and reference sources are usually credible, they struggle more when they begin to Google. Is History.com a credible source? What is The New Yorker? How do I determine if a source is for profit? Our librarians often expose students to multiple sources answering the same question and then ask students to talk through source reliability and bias. A great complement to this task is a Credibility Checklist and Bookmark. 5. Creating accurate citations. Few skills are more challenging for students than creating correct citations. Nevertheless, academic accountability is an important part of research and CCSS.ELA-LITERACY.W.9-10.8. Our librarians have worked hard to make sure students know how to access resources that will walk them through the steps for creating accurate citations. Most of the school databases give students considerable assistance, but there’s always a few tricks involved in citation. For this reason, our librarians have developed their own presentation for modeling citation skills, including formatting that tricky hanging indent! You can couple your librarians’ pointers with this MLA checklist! If my students are researching for a paper, they are probably eventually going to make a presentation. For this reason, I often rely on the librarians to help students prepare for and design effective presentations. Per CCSS.ELA-LITERACY.W.9-10.2.A, students should use formatting, graphics, and multimedia to help readers and listeners better comprehend research findings. For this standard, librarians can be helpful in providing students with the tools to ethically access and cite images. In particular, librarians can provide a mini-lesson for students on the concepts of public domain, fair use, and copyright. While I don’t expect students to be experts on these concepts, students do have an obligation to be ethical researchers, and the librarians are the experts on these subjects. Similarly, CCSS.ELA-LITERACY.SL.9-10.5 asks students to use digital media to enhance a presentation and engage an audience. While I enjoy using technology in the classroom, I am not a digital tools expert. For this reason, I often ask our librarians to make recommendations for students. Our librarians have introduced students to countless presentation tools: Canva, PowToon, Venngage, Biteable, Haiku Deck, Animoto, and Adobe Spark among others. In particular, the librarians are good at recommending a specific digital tool for a specific presentation need. For example, when my students were making Book Trailers earlier this year, Biteable proved to be a winner. But when my students were making handouts, Canva was the way to go. At the end of the day, inviting the librarians into your classroom helps students meet the library. Anything that encourages students to interact with literature and informational texts promotes literacy! Similarly, the more adults students meet in the academic setting, the more allies they find in the building, and the more resources they have for achieving success. How do you bring the library into your classroom? Let us know your suggestions in the comments! Recently, I wrote about the importance of maintaining perspective in education. At times, educators can get a little tunnel vision, especially during the long, cold stretch of the third quarter. However, experience is the best way to gain perspective in education (or, really, in anything). Perspective reveals truth. In fact, perspective has a way of revealing mistakes, misunderstandings, and misconceptions. For me, some of my greatest teacher misconceptions were laid bare my first year of teaching. There were concepts, strategies, and ideas that I (an all-knowing new teacher) flatly rejected. Things I vowed never to do. Some teaching techniques I viewed as ludicrous and refused to touch. Let me be clear: this was a terrible attitude. I had no humility. I had never heard of growth mindset, and I barely understood my teacher truth. Such hubris! In an effort to grow from my mistakes, I put together a list of strategies I now regularly incorporate in my classroom because I have more experience. In other words, here’s what experience and perspective have brought into my classroom. As a student, I hated brainstorming. My teacher would give me a graphic organizer, and I would feel limited. For this reason, as a new teacher, I vowed never to include brainstorming or any other visualizing hokey pokey in my teaching. Boy, that was nearsighted. Anchor Charts: As a secondary education major, my student teaching did little to teach me about using anchor charts. And my introduction to and adoption of anchor charts was slow, but now I use them all of the time. My classroom walls always have up at least two anchor charts. Creating anchor charts together as a class helps students visualize content and take ownership of that material. Find out some of my favorite anchor charts here. Brainstorming: As I mentioned earlier, as a student, brainstorming was not my thing. What I didn’t understand is that I was brainstorming. I was making lists and drawing my ideas. However, because my teachers limited me to brainstorming with a specific graphic organizer or outline, I felt frustrated and constrained. For this reason, when my students are embarking on a task that requires brainstorming, I try not to limit their thinking. I ask students to help me generate a list of brainstorming tools and techniques we already know about (perhaps even making an anchor chart). Then, I explain to students that they can use any version or combination of brainstorming ideas to get their initial thoughts out. All I ask is that students provide me with evidence of brainstorming. I even put together a menu of different brainstorming tools students could use. Student Goals: Another thing I hated as a student was goal setting. Setting goals felt purposeless because I knew we would set goals and never revisit them. For this reason, when I started incorporating these goal sheets (they’re FREE) in my classroom, I made sure that my students revisited their goals regularly. Additionally, I have also worked to help my students visualize their growth in meeting their grammar and writing goals. When students see how much they are growing, their intrinsic motivation increases. As a new teacher, I also scoffed at verbal processing activities. I didn’t see the value of techniques like think-pair-share. In part, I didn’t value these strategies because my own teachers didn’t use them well enough or often enough for them to be meaningful. However, when students are able to process aloud and to hear other students processing aloud, they are able to work through content. In other words, students begin to crystallize their own understanding and to recognize where they need additional guidance. Here are my tips for facilitating meaningful verbal processing and my favorite strategies. Facilitating Verbal Processing: One of the reasons I used to view verbal processing negatively was because my teachers did not use these strategies frequently. The first time students think-pair or turn to their elbow partners, it can be a weird experience. They’re feeling each other out. However, like most habits, the awkwardness disappears with experience. In other words, frequency is an important part of facilitating verbal processing. After I model a skill, strategy, or concept, I almost always ask students to generate a list of insights and uncertainties with an elbow partner. Similarly, established norms (like our list) help students understand what they should take away from a verbal processing session. Finally, accountability helps remind students that they are responsible for this part of their learning. However, accountability does not mean grading. I do not grade verbal processing. Instead, I make sure to be walking around and listening in on student exchanges, redirecting, prompting, and applauding as needed. Notice and Note: Since my school is emphasizing close reading, our students are using a version of Beers and Probst’s Notice and Note. This gives students a common language across multiple contents. One variation of verbal processing is to have students walk through a text together. Give students one copy of a text but two writing utensils and ask students to read the text together, alternating who leaves a notice or a note in the margins. By the time students finish the passage, they have moved beyond Notice and Note and have started engaging in a dialogue about the text itself. Questions Only: Toward the start of the semester, I do a mini-lesson on writing high-level questions. We then carry high-level questioning into every other unit of study. With this in mind, sometimes when my students process aloud, especially if the text has been particularly challenging, I ask them to focus their processing on generating questions about the text. With a challenging text, students usually end up with a handful of basic questions and loads of high-level questions. As a class, we honor our basic or comprehension questions because we know they are necessary components of understanding. Then, we tackle our high-level questions either through continued partner work or through a more formal discussion. Sometimes I have to chuckle about the different ideas I rejected as a new teacher. It’s my great hope that today’s new teachers are more open minded and humble than me. Here are a few other ideas I could have discussed today: teaching Shakespeare, incorporating choice and whole-class novels, and grading papers digitally. What are your never say never teacher moments? Where has your thinking changed and evolved? Let us know in the comments. For several years, the second unit in my junior English class has been the American Enlightenment. When dealing with this unit, teachers could easily reduce our Puritan forefathers to the fire-and-brimstone of Jonathan Edwards’ famed “Sinners in the Hands of an Angry God,” but that approach would skew students’ perception of early American literature. For this reason, I like to pair Jonathan Edwards’ work with Edward Taylor’s “The Ebb and Flow,” a poem about the speaker’s spiritual struggles. The reflective nature of the poem is a nice counterpoint to the fervor of the sermon. During our study of these two works, students often struggle with a few elements. First, why must the authors have such similar names? Sigh. Then, students struggle with tone, which I address through close reading. Finally, students struggle with the poem’s ambiguity. Does the speaker’s relationship with God remain positive? Or does the speaker lapse back into doubt? Who is in control of the speaker’s relationship with God? Since I know my students struggle with deliberate ambiguity, I’ve put together some strategies and titles to help your students also work with this difficult concept. Before diving into a text like “The Ebb and Flow” where ambiguity reigns supreme, choose a text that ends with resolution but not closure. For example, The Great Gatsby provides resolution but does not give readers a great sense of closure. During our close reading of The Great Gatsby’s famed conclusion, I introduce the concept of deliberate ambiguity. Introducing the concept early allows students to sit with the idea for a while. We discuss Fitzgerald’s choices in the conclusion. Maybe I’ll do an exit ticket, but we’re not ready for a summative assessment yet. Usually, I offer my students one or two examples of movies or shows that end with deliberate ambiguity, and then I ask them to think-pair-share more examples. More often than not, they come up with better and more relevant examples than I ever could. As with most new ideas, students have the most success with deliberate ambiguity when they work with it regularly. Not every text you read has to be ambiguous, but even the absence of ambiguity (which would be clarity) is an authorial choice worthy of discussion. Any time you work with ambiguity in your instruction, you are helping students work toward CCSS.ELA.RL.11-12.1, which asks students to make inferences about where a text leaves matters unresolved. Throughout the year, introduce students to some of ambiguity’s frequent companions. In particular, rhetorical questions and ambiguity often go hand-in-hand. Similarly, the color symbolism for ambiguity is often different than the color imagery related to greed, hope, or fear. As you might expect, gray is often the color of the ambiguous, and a common symbolic representation if fog. Additionally, as with most poetry, directing students toward meaningful punctuation can help them confirm and discuss ambiguity. Novels and Dramas: Apart from The Great Gatsby, other novels that include deliberate ambiguity include Things Fall Apart, Julius Caesar, and The Crucible. Interestingly, all of those titles end with death. And, apart from Gatsby, they all end with a suicide. Poems: Here are some other poetry titles to consider. What titles should we add to our list? How do you teach deliberate ambiguity? Let us know below? In honor of March Madness, I thought I would share how I use brackets for student engagement! Using brackets is an easy way to engage students and encourage collaboration while also keeping the dialogue organized. Most importantly, brackets give me quick formative insights into student work. Here are my three suggestions for using brackets and my three favorite bracket activities. Plan Ahead: As always, a lesson is always best when you plan ahead. First, know how and why you are going to use a bracket. Then, have the template you want ready to go. Next, make sure you know how you will facilitate the competition. Are you going to give a prize, or is winning itself the prize? I usually make this choice based on the group of students I have. Some are truly incentivized by a prize, but some classes cannot handle an additional incentive or are not interested. Work Short And Sweet: Put a word/space and time limit on the responses you get. Give students a sticky note to write on. This will limit the amount of space they can use and will stick neatly to the bracket. Additionally, I usually put my students on a 2-5 minute “shot clock.” This keeps students focused, invested, and producing genuine work without resorting to Google. A shorter time frame also limits opportunities for trash talk. Overall, keeping this activity brief makes it a formative experience rather than the totality of a lesson. Collaborate: Because brackets have limited space and because I usually give students a short time in which to work, I almost always ask them to compete in partners. This encourages students to collaborate and bounce ideas off one another, refining their knowledge and skill along the way. Collaborative Definitions: In my World Literature class, one of the first things the class needs to do is develop a definition of “world literature.” After doing a short reading (get the freebie here), students break in to partners and write their own definition of “world literature.” Then, we post the definitions on the board and compete head to head. As the class eliminates some options and advances others, they discuss which elements of a definition they valued, which seemed illogical, and which just needed some redefinition. Concise Summary: Part of the ELA CCSS 9-10/11-12 RL.1 standard is producing objective summary. In particular, my students struggle to create a concise summary. For this reason, after doing a reading, students will break into partners. Next, I’ll give each partnership a sticky note. Then, I will ask them to provide a summary of the reading as if it were a tweet. Oftentimes, we started with new twitter rules and 240 characters. Then, I challenge them to go even more concise with 120 characters. Students LOVE this activity. Then, we bracket the summaries and put them head to head until with have one summary to rule them all. As we go through the summaries, we discuss what choices their peers made in terms of concision. Where could we be more concise? And where do we actually needed more information? To elaborate on this activity or bump it to the next level, I ask students to produce concise and objective summaries. This is a great tool for formative assessment! Class Contests: In our Enlightenment Era unit, my juniors read about Benjamin Franklin’s use of aphorisms in anticipation of reading an excerpt from “The Crisis No. 1”, in which Thomas Paine uses aphorisms to argue in favor of the American Revolution. Over time, I’ve found that if students do not have some time to play around with their own aphorisms, they struggle to identify how Paine uses them. For this reason, I give students half of a sentence strip and ask them to compose their own aphorisms. Once we bracket the aphorisms, students have a chance to discuss the strengths of each one and the weaknesses of others. This kind of contest strategy could be used for any skill or concept students need to practice. For younger students, a contest practicing writing similes or using imagery would work, too. As with the summary activity, this is a formative check for me. Do you use brackets in your classroom? Let us know your best strategies and ideas in the comments! Hi! I'm Kristi from Moore English. I teach high school ELA. Reading is a conversation, and writing is a social process, so I hope you will join the discussion.